The iQ 30 Cart A complete, all in one iPad Cart / Tablet Cart solution that can sync, charge, store, secure and transport up to 30 Tablet devices. Includes NEW 5-slot Basket by PC Locs! - Efficient syncing. Using synchronisation software on your MacBook or PC, the iQ 30 Cart can sync up to 30 iPad, iPad Air, iPad mini or any other Tablet device simultaneously. - Efficient USB charging. With 2.1 amp power at each port, the iQ 30 Cart is capable of charging up to 30 iPad, iPad Air, iPad mini or any other Tablet device at the same time. - Extremely portable. The iQ 30 Cart is equipped with six removable 5 slot Carry Baskets (new design). This makes iPad, iPad Air, iPad mini and Tablet deployments easier. - Secure syncing and charging. Two external USB host ports are located outside the Cart, so you can sync or charge your devices whilst being secured in the Cart. - Style meets functionality. 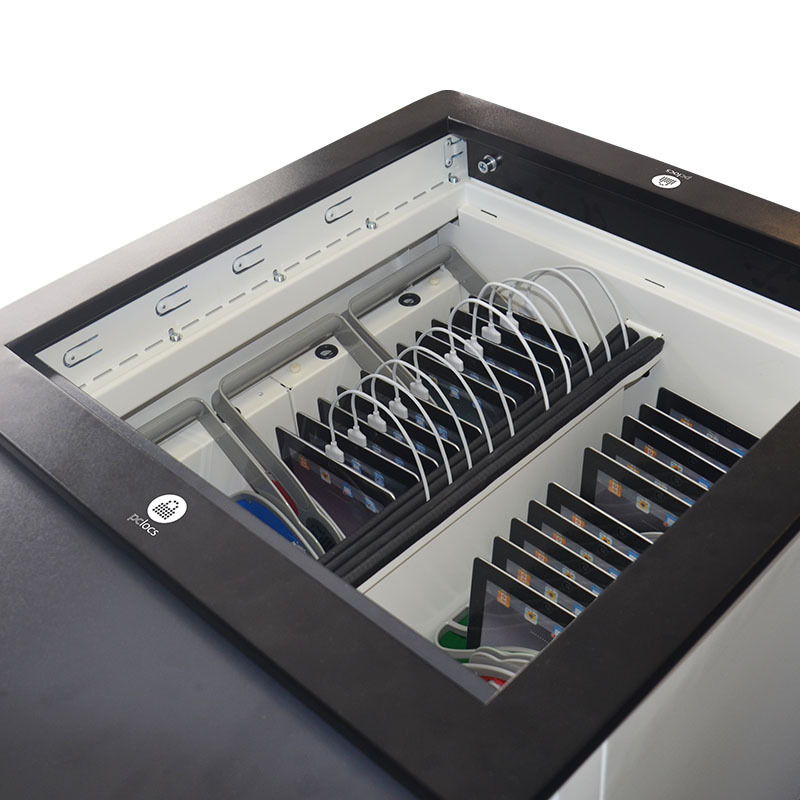 The iQ 30 Cart features a sliding top lid so that iPad devices can be accessed quicker, easier and by more users at once. - Improved cable management. The iQ 30 Cart features a new centre channel system that holds all the cables in place. It is neater and easy to setup. - Go mobile! This iPad Cart / Tablet Cart is designed to be mobile, so you can create an instant learning environment in almost any location. - Lock it down! After a day of use, lock the sliding top lid and attach the heavy duty anchor kit for securing the iPad Cart whilst its not in use. - Compatible. The new carry baskets are designed to accommodate all iPad devices with or without cases and other Tablet devices. - Intelligent power management system. The iQ 16 Sync Charge Box automatically stages the availability of power to each port. This function prevents the potential of overloading the circuit and protecting your devices.